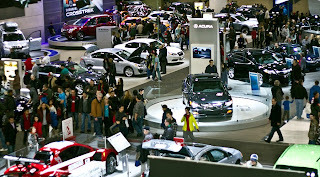 Today Chris, Hannah and I headed to the Metro Toronto Convention Centre to check out the 40th annual Canadian International AutoShow, happening now until Feb. 24th. While ole Gold Bug (our Toyota Corolla) is still in good condition, we realize if our family ever grows so must our vehicle. So we were checking out bigger cars from our favourite brands - and other features at the AutoShow. Seeing the Hot Wheels Camaro was pretty cool - too bad neither Chris nor I have data on our phones - if you do, and you tweet a specific message you can get a free Hot Wheels car. 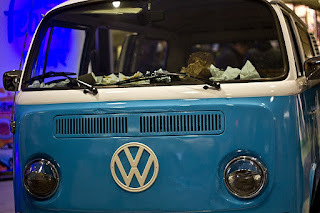 We also made sure to visit Febreze Van (I felt like I was in the commercial, even with a bunch of garbage inside, the van still smelled amazing thanks to Febreze CAR Vent Clips). The Febreze Van with ample, gross garbage. We looked in at the garbage...would it really smell good inside? We look happy because it smelled GREAT! Unlike other products, the Febreze CAR Vent Clip doesn't only mask unpleasant odours, it eliminates them leaving a light scent for up to 30 days. This car freshener uses a special microporous membrane to deliver a continuous scent and features an adjustable intensity dial. The come in a variety of scents, including three new ones - New Car, Alaskan Spring Time and Vanilla Moonlight. If you attend the show, you can get a free sample (usual retail price approximately $3.99)! If you take your kids I recommend getting there right when the show opens - they have special stroller parking spots close to the entrance. They also have secured all the elevators for stroller and wheelchair use only. And, if the show gets too busy you can drop children 2 and older at the Volkswagen Children's Playcare Centre, a great option for parents who are seriously looking at cars to purchase. I felt like Britney Spears in this photo. Thankfully the car had no key - we weren't going anywhere! Have you visited the CIAS 2013? If so, what did you think? And most importantly, did you check (er, smell) out the Febreze Van? Looks like you had a great time at the Auto Show. I'm going on Tuesday and we are very much looking forward to it. Thanks for the hot wheels tweet tip. I will have to look for that. Love the photos and the comment about being Britney Spears, made me seriously laugh out loud! I'd love to go one day to the car show. I know I would like it. Just bought a new car though so will have to wait till we are in the market for another one. I had to explain it to Chris...so happy others understood! Oh sorry. I forgot to mention that the Hot Wheels was a tweet thing. But I heard they were handing out Hot Wheels cars in standard packaging to those that did not have a smartphone or twitter account. Love the pictures dear hope you have fun. I guess it was jam packed.